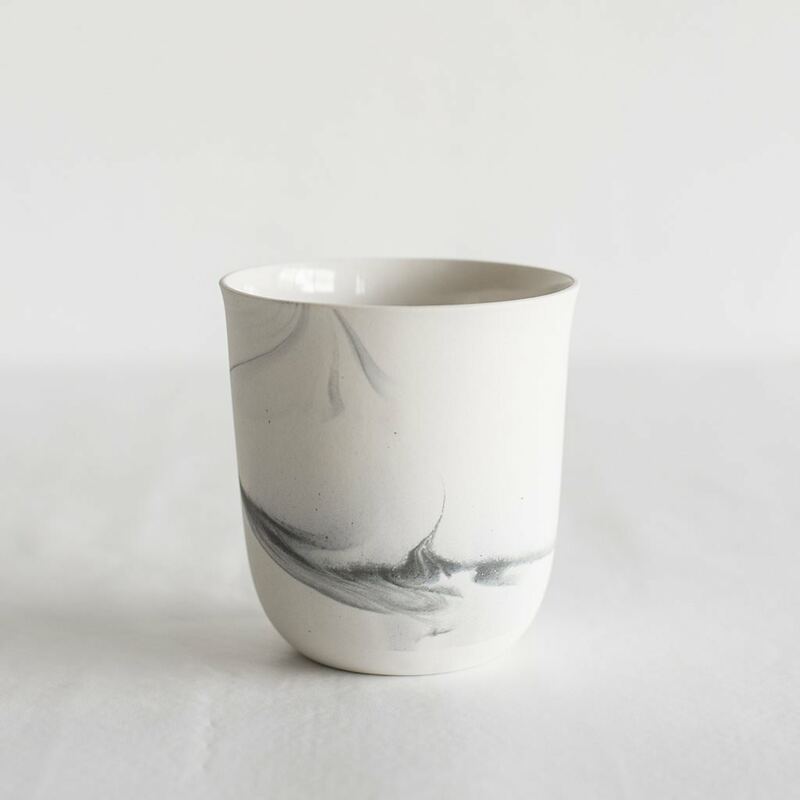 Description: RPC-808 is a hand-carved white marble cup of approximately 7.5 cm in height and 5cm in width. It has an internal capacity of 124.3 mL and weighs 184.26 grams. RPC-808 exhibits no apparent anomalous properties besides the memetic effect of causing subjects, when viewing at RPC-808, to be thirsty. It neither compels viewers to make use of it nor does anything to entice use beyond the minor thirst effect. This effect dissipates harmlessly within three minutes upon breaking visual contact with RPC-808. Additional anomalous properties manifest when a subject introduces a minimum of 100 mL of fluid into it at which point the subject becomes compelled to drink the contents. Attempts to prevent the subject from drinking the contents of RPC-808 are met with violent resistance on the part of the subject until they are able to do so. When a fluid has been poured into RPC-808, any attempts to pour a second fluid into it is met with an unknown force that causes the fluid to divert from the top of RPC-808. Fluids mixed before introduction to RPC-808 may be poured in without this trouble. Once RPC-808 has been sufficiently filled, no method has been shown to be able to empty it besides consumption by subject or termination of subject. Testing with CSDs shows termination to inevitably cause RPC-808 to be knocked over or otherwise spill it's contents in 100% of recorded tests. The results of consumption are different with every kind of fluid tested. It would appear that the concept of the fluid is more important than the actual chemical makeup. For instance, two tests made with two different types of grape juice showed matching results despite one being 100% fruit juice and the other being from concentrate, water, and added sugar. This means testing is limited to the type of drink, not the chemical makeup. The final result of RPC-808's effects on subjects appears to be determined by the taste of the fluid and the perception of the subject deciding what kind of fluid it is. This is supported by the results of Test Log RPC-808-08. Please refer to logs for further details. Please adhere to the following format when logging tests for RPC-808. Attach all subject medical files and additional observations to test log. Additional Researcher's Notes: It would appear that drinking water from RPC-808 holds no anomalous effects. Results: CSD-1357 experienced extreme pain and proceeded to undergo a form of mitosis in which two exact clones of CSD-1357 resulted. These clones were in critical condition as physical examination reveals all of their body fat and upwards of ninety percent of their muscles mass was lost in the process. CSD-1357-01 and CSD-1357-02 were in critical condition but made full recoveries within two months of medical care and rehabilitation. Additional Researcher's Notes: It would appear to force a complete mitosis of the subject. However it achieved this is unknown at the amount of mass lost in CSD-1357 was not enough to facilitate the creation of CSD-1357-01 and -02. Both subjects appear to be perfect copies of the first apart from the severe malnutrition and muscular atrophy. Further examination and psychological testing of both subjects is underway. Fluid: █████ Brand Powdered Grape Juice mixed with purified water and amount of sugar listed on package. Results: Exact duplication of test log RPC-808-02. CSD-2643 underwent rapid, total mitosis and the outcome matched expected results. Additional Researcher's Notes: This seems to indicate that the type of fluid does not matter so much as the concept of it. In this case fluid similar to that found in purple grapes causes subjects to duplicate themselves. For this test we selected a much heavier subject and testing was much more successful. CSD-2643-01 and CSD-2643-02 still lost one hundred percent of body fat, but post-test physically showed them to have only lost ██% of their muscle mass. I am reporting this to higher ups as a possible method for the retention of important personnel. Stuff a few hundred cheeseburgers down their throat and then make them wash it down with some grape juice and thus. Easy cloning. Fluid: Pasteurized Cow Milk, 1% Fat. Results: CSD-2111 dropped RPC-808 and proceeded to scream in pain for two solid minutes despite a complete lack of breath in their body. During this screaming, CSD-2111 grew in both height and mass until they had gained approximately 22% in height and 58% in body mass. Subsequent physical showed weight gain to be almost exclusively bone and muscle mass. Psychological testing showed subject had mentally regressed to an age of ██. This regression has shown to have caused severe cognitive impairment and has been totally resistant to all psychological recovery techniques. Additional Researcher's Notes: Good lord, when you boys told me this mug could clone people, I was shocked. When you said you were suggesting we test milk, I didn't know what to think. It turned this damn D class into a brute. He's got to be at least ██ and a half meters tall and he looks like he could bench my car! Might turn him into an idiot, but it's physically impressive. Keep it up, see what else is possible. I'll see that you get an extra source of CSDs for testing. Results: CSD-8843 underwent total molecular breakdown and conversion into an as-of-yet mysterious acid. This acid caused severe damage to the containment chamber and the only remaining sample of it was discovered in RPC-808. Designated RPC-808-05A, the acid was successfully contained in a container coated in RPC-███. Additional Researcher's Notes: No tea. I'm warning all future Researchers this now. It almost melted a hole down to Research 3F. Not unless they want a massive mess to clean up. Results: Once CSD-629 finished drinking the contents of RPC-808, CSD-629 screamed violently and light could be seen shining from within CSD-629's body. Smoke issued from CSD-629's every orifice and thermal imaging showed an internal temperature of greater than 375 C. CSD-629 collapsed. Post experiment autopsy showed CSD-629's entire vascular system combusted and burned until consumed. Additional Researcher's Notes: Sudden combustion of the entire vascular system has very little continued use. A surprise to nobody, we probably shouldn't be drinking gasoline. Nevertheless, it is interesting that RPC-808 forces the subject to consume the cup and even makes them eager to do so even if the contents are something you wouldn't normally drink. Results: Upon consumption by CSD-4449, CSD-1333 immediately died of cardiac arrest. CSD-4449 started to shrink in size. This continued until CSD-4449 was reduced to the size of a child. Physical examinations showed CSD-4449 to be a child of ██ years old. Subject retained all memories of life, but psychologically had regressed to an appropriate mental age. After examination of the medical records of CSD-1333 and CSD-4449, it would appear that CSD-4449 regressed in age equal to how old CSD-1333 was. Additional Researcher's Notes: Under the order of GCSD-█, all future testing with human blood is suspended. Any personnel found to be doing so will be immediately terminated. Results: Test repeated test RPC-808-04 exactly, with the exception that CSD-19571 was not told what fluid was in the cup, is incapable of taste, and was blindfolded during the test to prevent any attempt to discern what was being drunk. The results mirrored that of test RPC-808-01 instead of the expected -04. Subject experienced no anomalous effects. Additional Researcher's Notes: It would appear that the subject's own perception of what they are drinking affects the anomalous effects of RPC-808. Testing upon this hypothesis continued in test RPC-808-09. Results: Test repeated test RPC-808-08 exactly, with the exception that CSD-19571 was told what fluid was in the cup, and was allowed to see during the test. The results now mirrored that of test RPC-808-04. Subject gained approximately 29% height, 68% body mass, and was mentally impaired in line with expectations from previous tests. Subject terminated following escape attempts during return to containment. Additional Researcher's Notes: When the subject was allowed to perceive what they were drinking, despite being unable to taste it, they were affected as expected. Final test in this hypothesis recorded in log RPC-808-10. Results: Test continued in line with RPC-808-08 and -09 with the exception that CSD-6633 was able to taste but was also blindfolded and not told the fluid they were drinking. The results now mirrored that of test RPC-808-04. Subject gained approximately 23% height, 61% body mass, and was mentally impaired as all previous results predicted. Additional Researcher's Notes: With perception being purely based on taste, the results followed the trend set by the first test with milk. It would appear that both psychological and physical perceptions of the fluid determine the effects of RPC-808. When only one or both are present, test proceeds as expected but when both perceptions are impaired, RPC-808 is rendered harmless. In other words, someone blind, deaf, and tasteless would be able to use it with almost complete immunity. We know how the effects are connected to the fluids and the subject. Now we must find out if any other fluids hold useful effects for the Authority's cause. I am advising open testing to Director McGantly immediately. Any CSDs up for termination should have a last drink, ya know? Results: Subject had attempted an escape and was apprehended shortly. Subject on his way back to the testing chamber, was kicking and screaming "NO! QUIT TELLING ME TO DRINK BLEACH!! JUST STOP! DRINK IT YOURSELF!". Additional Researcher's Notes: Can someone please get him drinking at gunpoint? Seems like he know he's gonna drink it. Did someone say something to him about these tests? Results: Subject reluctantly poured, and then readily drank the bleach due to RPC-808's anomalous effect. Everyone within approximately a 20m radius turned completely bald. Some lost their skin color and turned bleach white, while others has their uniforms bleached. A few seconds later, subject suffers all three effects simultaneously to a greater degree. Subject appears to lose all pigment in body, as well as their CSDs jumpsuit was bleached completely colorless. Subject starts rolling on the floor, screaming in agony for 9 minutes and 17 seconds. Subject subsequently perished due to multiple organ failure. Additional Researcher's Notes: Serves him right. The bugger started bragging when everyone around him turned bald. Thankfully for me, I'm already bald. Results: Exact duplication of test log RPC-808-12. Subject poured the bleach without reluctance and drank it. Dr. Kodler was not effected despite being within 20 meter radius of the subject, and reluctantly admitted his hair was artificial. Additional Researcher's Notes: Seems like it doesn't effect artificial bearCSD- err…hair, and distance does matter, I was 19 meters away from subject during the experiment. I'm not bleached, and neither are my clothes. Fluid: ████-███ brand lemon drink prepared with the exact amount of water and sugar specified on package. Results: Upon consumption, subject exhibited marked mydriasis, sialorrhea and an increase in heart rate. When questioned subject remained silent. Upon being told to put RPC-808 back on the table, subject complied instantly. Chemical burns were observed to progressively develop around subject's oral cavity, when questioned about these burns subject denied feeling any pain from them. Analysis of saliva samples reveal an altered composition, demonstrating the presence of [REDACTED] acid, an increase of lipase and amylase in saliva, and a marked increase in cortisol in saliva. Additional Researcher's Notes: Subject was treated for oral burns. After consuming the contents of RPC-808 subject exhibited unquestioning compliance to orders from staff. It should be noted CSD-121092 was a difficult and resistant individual. Subject was terminated 2 hours later due to extensive chemical burns on oral cavity, pharynx and esophagus. Results: After pouring the liquid, CSD-593433 drank without problems. One hour after drinking the mixture, subject began coughing intensely. After 2 minutes of uninterrupted coughing, subject died of asphyxia. 41 seconds after loss of life, cockroach specimens started to spawn from the body, using the mouth, ears, skin pores (larvas), and eyes (after pushing them out of the subject's skull). The body became a food supply for all specimens. A total of 73 cockroaches were counted. Additional Researcher's Notes: Do not attempt to test in a open environment, as the cockroaches appears to be able to digest any type of meat, and will work in conjunction against larger targets. We had to burn the chamber. Fluid: White tea, made from ██████-██████ brand loose tea leaves, held in a cloth paper bag. Results: CSD-89941 drinks tea without significant incident. Notes that they do not enjoy the taste of white tea, and that the liquid was slightly too hot and had "burned [their] tongue a little." Three seconds after the subject returned the empty cup to the test stand, a number of personnel within a 3-kilometer radius began to suffer from symptoms of severe opioid overdose, accompanied by a strong smell of opium. Incident resulted in the deaths of ██ personnel, including Dr. Mingxuan. CSD-89941 demonstrated no unusual symptoms and was returned to CSDs holding area. Additional Researcher's Notes: Subsequent research into result showed all casualties were at least 75% Han Chinese by ethnicity. CSDs subject was European-American. Results: Upon drinking, CSD-9876 gained approximately 1776 pounds, despite showing no outward physical changes. The subject appeared to be able to move and act without any hindrance despite the immense weight gain, suggesting a comparable increase in strength. Further testing was halted due to CSD-9876 attempting to breach containment. Subject showed ability to barrel through walls and kill with punches due to simple inertia alone. Termination required extensive force from ASF personnel, as bullets were only slightly effective against subject. Termination achieved with conjunctive fire from nine personnel with heavy assault weapons after ██ causalities across Site-007. As appealing as it might be to use this to make some super powered MST, physical examination of CSD-9876's body shows micro fractures in every single bone and tears in every single muscle in their body. If ASF hadn't bought them down, they would've torn themselves to pieces in minutes. Clearly it doesn't give the body what it needs to survive such increased weight and strength. ~Dr. McGantly. 1. Voluntary subjects must sign paperwork RPC-808-01 through -07 and complete a full physical before and after testing.